GemOro UltraSpa Dual Ultrasonic and Steamer in Slate. Ultimate professional quality jewelry cleaning system. The world's only personal combination jewelry cleaning system utilizing both an ultrasonic cleaner and steam cleaner in one specially designed appliance for the home or jewelry store. The ingenious UltraSpa is a professional quality machine that provides ultimate cleaning results for sparkling diamonds, gold, silver, platinum jewelry, metal watch bands and more. Totally in a class by itself, the UltraSpa has both powerful ultrasonic cleaning and high-pressure steam cleaning in a single appliance. With a two-stage cleaning process, scrub dirt and grime with intense ultrasonic sound waves and then with the steamer blast away hidden dirt and the remaining residue from all hard to reach areas with amazing results like no other jewelry cleaner - period! 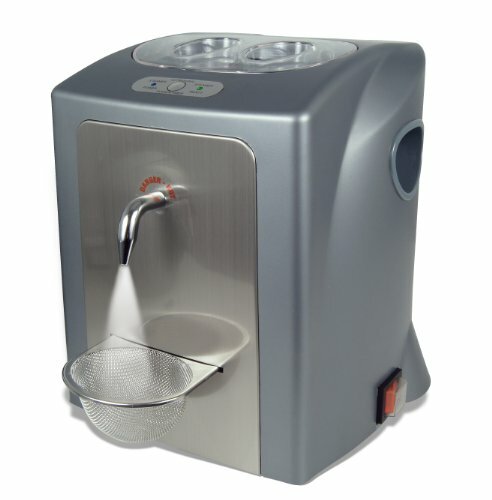 1-pint tank capacity ultrasonic cleaner. Ultrasonic generates a powerful 42,000 scrubbing waves per second using regular tap water. Ultrasonic cleaner comes with a basket and evaporation resistant transparent cover with bright blue built-in LED tank illumination. Control panel provides a 6-minute timed ultrasonic cleaning cycle that automatically shuts off when completed. Perfect size approximate 1-pint tank capacity steam cleaner. Powerful steam cleaner safely generates a robust 50 PSI of pressurized steam using regular tap water. Easy to use steam control activation for on demand burst steam cleaning. Built-in water fill funnel. Easy lift handles for moving and storage compartments for accessories. Compact size conveniently fits on counter and stores underneath. Includes: Steam residue mat, measuring fill cup, jewelry holding tweezers and 2 sizes of handheld mesh baskets for holding diamond ear studs, charms, rings, bracelets that both store in a clever rear compartment. Designed in the USA for safety. ETL Listed. 1 Year limited replacement warranty. Item Weight: 6.55lbs. Item Dimensions: 12 x 10.75 x 11 Inches. Customer Service Number: 800-433-5544.